On 23rd June 2017, a year after the Brexit referendum, we thought everyone needed to relax a bit and dance. 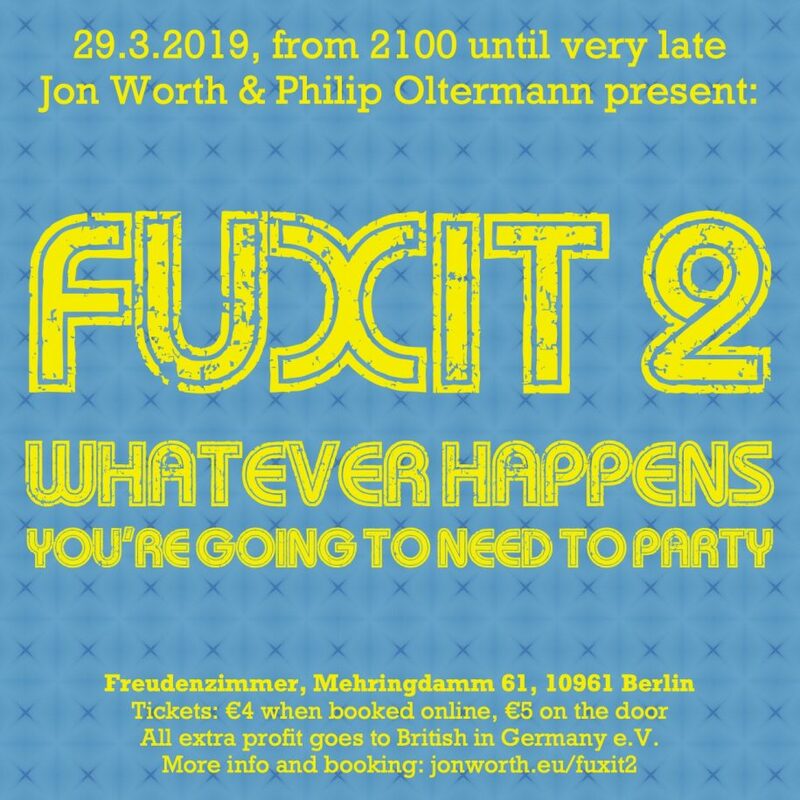 So Philip Oltermann, Jeremy Cliffe and I organised FUXIT, a music night where we played only UK music released between 1.1.1973 and 23.6.2016. Now we’re back with FUXIT2. The idea – to give everyone a good night to distract them from politics – is the same as before. But this time we’re reversing the music – we’ll play something from each of the other 27 Member States of the European Union, released since those countries joined the EU. Got a great song tip for us? Please use the form below to tell us! We would please like you to buy tickets beforehand – these cost €4.75 online, or will be €6 on the door. Any extra money raised will be donated to British in Germany e.V. There will be a debate about Brexit between 1930 and 2100, and then the music and dancing will start. If you want to only come to the debate (why?) then entry is free – please use the form below to tell us you will be attending. Likewise if you are from the press and want something amusing to film on Brexit night, then please use the form below to tell us about it.